A MAN WHO reportedly mocked alligators was killed shortly after jumping into the water with them. Tommie Woodward, 28, from Orange County, Texas, had been swimming in a Bayou near the Louisiana state line on Friday when he was attacked. His body was found hours later. A woman who had been swimming with him was unharmed. Local TV station KFDM quotes Justice of the Peace Rodney Price as saying the man ignored a sign erected at Burkhart’s Marina last week after locals spotted a ten-foot alligator. “He said “blank” the alligators and thereupon jumped into the water,” Price said, adding that Woodward was immediately attacked. 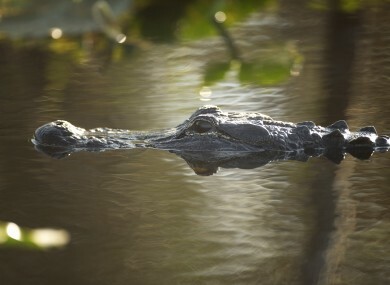 An employee at the restaurant beside the bayou, Michelle Wright, told the station that she had pleaded with Woodward to stay out of the water. “I asked him please do not go swimming, there’s a bigger alligator out here, just please stay out of the water. Next thing I know this girl is screaming “An alligators got him, an alligator’s got him” and I grab a flashlight trying to zoom it over the water, trying to find him. “The next thing I know, I don’t even know how long it was, I saw his body floating face down and then he’s up there for a couple seconds and then he gets dragged back down and pulled off. Email “Man shouts "f*ck those alligators", jumps into water, gets eaten by alligators”. Feedback on “Man shouts "f*ck those alligators", jumps into water, gets eaten by alligators”.